It seems as if you have arrived at this book review by mistake. 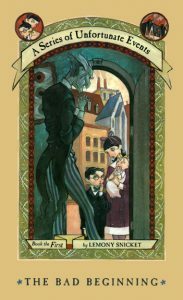 There is no other reason that lovely children such as you would want to read the distressing tale of the Baudelaire orphans. In fact, I highly recommend that you turn your eyes away and read the review of a much happier book (perhaps one about a young boy who lives in a giant peach). For the sad tale of the Baudelaire orphans is filled with mystery, danger, and intrigue at every turn: from villainous theater troupes to pasta puttanesca recipes. It will be sure to keep you up all night. Recommended for 5th grade and above, or for the precocious 4th grader. Look for this book online or at your local bookstore! Henry is horrid. That’s what everyone says (even his teddy bear). 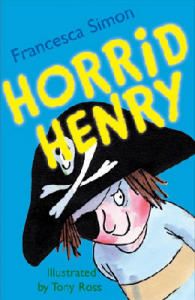 Join this horrid and hilarious little boy on the four comical misadventures featured in this book by Francesca Simon. In “Horrid Henry’s Perfect Day”, “Horrid Henry’s Dance Class”, “Horrid Henry and Mood Margaret, and “Horrid Henry’s Holiday” we see this despicable little boy wreak havoc all over the place. Whether it’s a dance recital, family vacation, or just playing with his neighbor, Moody Margaret, Henry is sure to be… well… horrid. But don’t let his name full you. These stories are sure to delight parents and children alike! This book would make an excellent read aloud book for grade school students. Its cleverness and humor will capture the hearts of even the most reluctant little readers. All guinea pigs of Dandeville love eating dandelion leaves. They eat them for breakfast, lunch, dinner and snacks Our main character, Nibbles, loves eating them, even more than he loved playing soccer. But one day, the dandelion leaves begin to run low and the guinea pigs must resort to eating cabbage instead. Eventually, there were no more dandelion leaves because they had all been eaten. All except one last dandelion that happened to be growing outside of Nibbles’ window. Even though Nibbles desperately wanted to eat the leaves, he chooses not to. Instead he researches dandelions on the internet and begins to take very good care of his dandelion. Nibbles patiently waits until his dandelion grows seeds and then from a tall hill he blows the seeds into the air. Soon the fields were filled with dandelions again, and Nibbles saves the day! With this simple and enjoyable tale, a lesson of renewable resources to a level that even small children can understand. The colorful, friendly illustrations, filled with round-bellied guinea pigs, will catch any child’s attention. 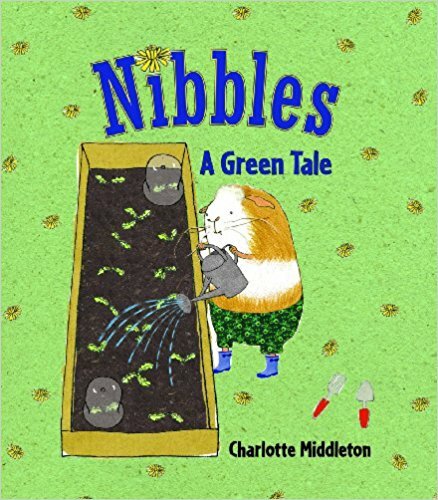 This book is a great choice when teaching younger children about being more “green” or simply about gardening. 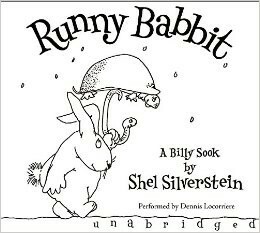 Runny Babbit was the last book written by Shel Silverstein before his passing in 1999. This book was a work in progress for more than 20 years while developing all of the silly poetry. This silly book or as Runny Babbit would say billy sook is a book filled with Silverstein’s brand of poetry all while using a process known as spoonerisms to create this fun book. Spoonerisms are a process which involves switching the first consonants of certain words such as Dommy and Mad instead of Mommy and Dad in a sentence to create nonsense words within the poem. At first the language doesn’t make sense, but with the help of the Silverstein art work for each poem and a little effort it becomes fun to read the story and figure out what Runny Babbit is really saying. Shel Silverstein’s ability to write about everyday life in his poems like chicken pox a messy room or a date makes this book all the more fun to read. Children will have fun reading the poems and figuring out the names of Runny Babbit’s friends such as Skirty Dunk , Toe Jurttle,Dungry Hog, or Snerry Jake to name a few. All of this fun in reading without realizing they are building the ability for increased concentration while improving phonemic awareness. This book can be recommended for grades 2-4 for reading aloud and thru grade 8 for personal reading it correlates to the Common Core Standards in English Language Arts. Roald Dahl’s James and the Giant Peach is a characteristically whimsical adventure that follows an oppressed young boy on the adventure of a lifetime. After a mysterious man gives him some magical crystalline crocodile tongues, James Henry Trotter discovers that his once-barren peach tree is suddenly bearing fruit…giant fruit! When he clambers inside, he meets a delightful assortment of monstrous, though good-hearted arthropods, and his newfound friends whisk him away on an adventure over land, sea, and sky. Even in the face of hungry sharks and malevolent cloud-men, Dahl’s friendly style keeps things from getting too scary. He also takes a few breaks from the story to inform young readers about the fascinating real-life qualities of the various creepy-crawlies that accompany our young hero. Informative! Finally, the sporadic bursts of song and poetry are sure to delight young readers with their bouncy cadence and rhythm. Children of all ages are to sure to be entertained by this humorous and charming book. 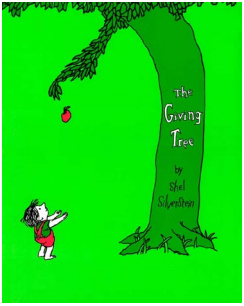 Three things to think about while reading The Giving Tree. What do you know about giving? What do you know about being kind? What do you know about taking too much from someone who care? This tale emphasizes unconditional love, kindness, and giving. Every day the boy would come to the tree to eat her apples, swing from her branches, or slide down her trunk…and the tree was happy. But as the boy grew older he began to want more from the tree, and the tree gave and gave. This brilliant book shares the beauty of generosity and the power of giving. Perhaps even a lesson on taking too much. Three things you need to know about naked mole rats. They are a little bit rat. They are a little bit mole. That is until Wilbur, a naked mole rat who loves wearing clothes: fancy clothes, silly clothes, all types of clothes. 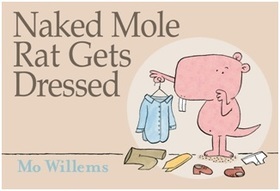 All the other naked mole rats find Wilber’s wardrobe offensive and try to get him to change. “Naked mole rats don’t wear clothes!” they say. Wilbur simply replies, “Why not?” What will happen when Grandpah, the oldest, wisest, and most naked Naked Mole Rat ever, considers Wilbur’s question? “Naked Mole Rat Gets Dressed” is a delightful book, filled with humorous illustrations, that will teach young readers the importance of being themselves and accepting views and beliefs different from their own.